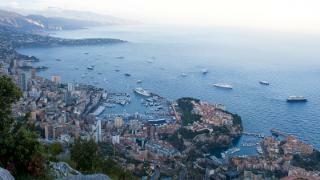 In May the world of superyachts and motor sport come together for the Monaco Grand Prix. Every year the glamorous event draws some of the world’s largest superyachts and this year’s Grand Prix was no exception. 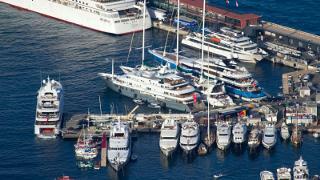 More than 170 superyachts were spotted in and out of the harbour over the weekend. Of course the best place to watch all the action is in Port Hecules where the yachts in the prime berths are just metres away from the racetrack. More than 130 superyachts were in harbour on Thursday (May 27) so that guests could enjoy the Practice Day action where Red Bull's Daniel Ricciardo set the fastest pace. The first Monaco Grand Prix was hosted in 1929 and over the past nine decades the yachts trackside have changed dramatically. This impressive aerial shot gives you a great perspective on this year's lineup. This picture shows some of the larger yachts docked in Port Hercules — 82.3 metre Secret, 75.5 metre Boadicea _and 99 metre Madame Gu. Some of the other largest yachts moored in the marina were 81 metre Romea, which was delivered last year, and 63.22 metre explorer yacht _Force Blue. 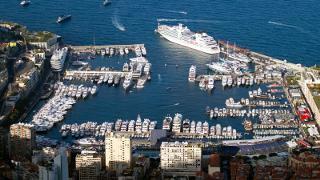 Not all of the yachts can fit in Port Hercules for the event so many anchor offshore in the harbour. 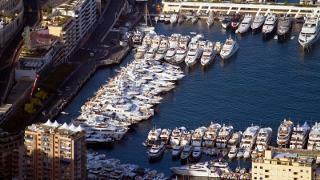 39 superyachts were spotted in the harbour on Thursday (May 26). Some of the more famous yachts included A, Ulysses, Quantum Blue, Ecstasea, Sunrays, Silver Fast, Martha Ann and Okto. 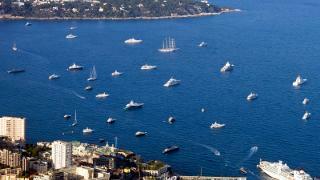 Many of these yachts have been in the French Riviera for the past few weeks and were spotted at the Cannes Film Festival. Some superyachts chose to moor in nearby Villefranche-sur-Mer. The natural harbour, which is very close to Monaco, is a popular spot during the Grand Prix — especially as this year's weather was changeable. In this picture you can also see a selection of large sailing yachts, including 62 metre Baboon, 45 metre Salperton and 41.33 metre Alejandra. 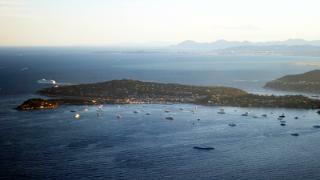 Some superyachts were spotted anchored off Saint-Jean-Cap-Ferrat hiding from the inclement weather over the weekend. 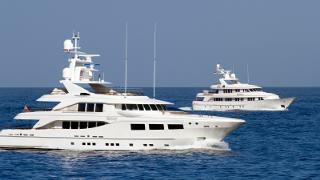 One yacht that stood out at this anchorage was World Superyacht Awards Motor Yacht of the Year Savannah. She was in good company as other yachts spotted here included Atlante, Kibo and Stella Maris. 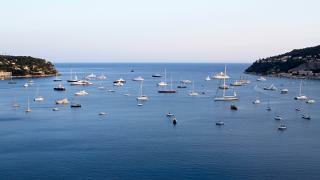 Some superyachts were spotted anchored off Saint-Jean-Cap-Ferrat hiding from the inclement weather over the weekend. One yacht that stood out at this anchorage was World Superyacht Awards Motor Yacht of the YearSavannah. 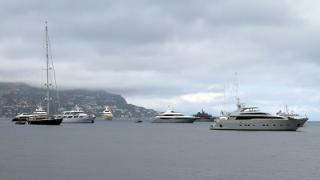 She was in good company as other yachts spotted here included Atlante, Kibo and Stella Maris. This image shows the other part of the fleet in St Jean. As well as the impressive line up of superyachts this picture also gives you a view of the French Riviera — taking in Villefranche, Nice, Cap d'Antibes, the bay of Cannes with the Lerins Islands, and the Estérel mountains and St Tropez just hidden by the fog. Like everything in life all good things must come to an end and Feadship Seaflower and Hakvoort Revelry were two of the first superyachts spotted leaving the Monaco Grand Prix. Much of the rest of the fleet is still in the region and plenty of celebrities have been spotted on board celebrating Lewis Hamilton’s victory. 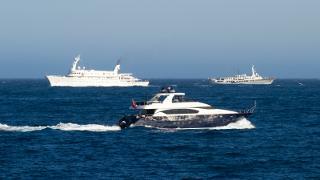 Voyager and Asha were also among the group of yachts making a swift exit from the Grand Prix. This picture also shows Atlantis II cruising back into Monaco. The 115.76 metre yacht rarely leaves her berth in Monaco except during the Grand Prix because her berth is used for other yachts during the event.